Here’s a confession for you. We rely upon online deliveries from the supermarket. Yes, the supermarket – that bastion of evil that lurks on the outskirt of every large town. In an ideal work we would shop locally and buy produce from markets and makers. However a combination of living semi-rurally in a small village with only one small convenience shop and a butcher’s, and a once weekly visit from the fishmonger’s van (we’re vegetarian, so the butchers or fish van is of no use to us! ), without a car, and all the other time pressures of life, such as jobs, a small child, social lives, etc, means it is difficult for us to shop in any other way. For quite a few years now we’ve gotten a supermarket order delivered fortnightly to us. Inbetween deliveries we top up on things we need, like fresh food and bits and pieces, with, generally, the Co-Op, Earthy Food Market, Real Foods and Marks & Spencer (their green thai curry sauce is amazing, and the only one that I’ve found that is veggie friendly). A couple of years ago we tried a local vegetable box scheme, and it just wasn’t for us. Instead we try and grow our own herbs and vegetables as much as we can in the summer. We’ve had a few hits (a veritable courgette explosion! A whole summer of never having to buy lettuce!) and a few misses (including one very wet summer a year and a half ago where slugs ate EVERYTHING that dared to as much as poke it’s head out of the soil), but by in large our food comes from the supermarket. Were there any surprises here for you? 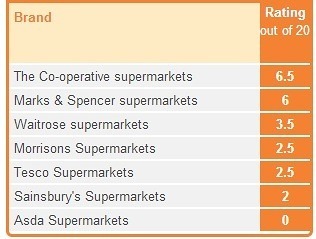 I was also surprised as I thought Waitrose would score a bit more highly than what they did, and that the most ethical supermarket, the Co-Op, doesn’t really score that highly in terms of ethics. If we wanted to switch to a supermarket that performs better than Sainsbury’s we’re a bit stuck. The Co-Operative doesn’t offer home delivery unless you do your shop as normal in a selected store (a 12 mile plus journey for us); Marks & Spencer don’t deliver groceries; and we’re outwith the Waitrose/Ocado delivery area. However, I’d like to source at least some of our food more ethically. I like to think there may be more ethical alternatives to online supermarket shopping out there that will fit within our modest food budget, even if it means buying some items from some independent retailers and still using online deliver from the supermarkets to a lesser degree. I’m going to spend the next little while looking into this and I hope to report back soon with my findings! Do you use the supermarket? Or have you found any good online sources that offer delivery and aren’t too pricey? I’d love to hear! I’ve been pondering over this a lot recently as well. I buy all of my meat from my local butcher (who’s thankfully only a 10 minute walk away) and get our veggies delivered by Riverford, which I’ve found to be the best of the ones we’ve tried. We’ve cut back on cleaning products and opt to buy in bulk (5L bottles of white vinegar!) from Amazon instead. Everything else is either from Waitrose/Ocado or Infinity Foods. It’s taken a lot of trial and error to get to this point, and I’m still pretty unorganised! But we eat a whole lot better since abandoning Tesco! It sounds like you’re doing really well Lucy! Thanks for sharing – it’s really useful! There didn’t seem to be a lot of choice for veg boxes near us, and even though we eat a lot of veggies we could never seem to get through them all even though we got the smallest box, so seemed to be wasting a lot of food. I’ve also found 5L bottles of vinegar on Summer Naturals – http://www.summernaturals.co.uk/index.php?main_page=product_info&products_id=341 £4.99! That’s a whole lot of cleaning!! Try Suma in Elland Yorkshire. Fantastic ethical company. Dry goods and chilled foods, cleaning products, hair and body products and loads more. There is a minimum order but think ahead and only order once for the year. All run by a workers cooperative where everybody earns the same. No shareholders. Please don’t buy your vinegar from Amazon. They don’t pay their employees fairly, have zero hours contracts and dodge their taxes.